Association and are yet today associated with them. Since that time twenty-six Pastors, including our present Pastor Brother Michael Long, have served the Church. had been donated and sent to the mill to be sawed for this building. added to the grounds and a large cemetery encircles the facilities. A large school building was purchased from Rock Hill School District and on the Fifteenth Day of November, Two Thousand Two it was dedicated to the Lord’s service. 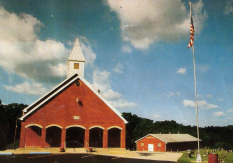 This is now the home of Landmark Baptist Bible College and Sugar Creek Christian Academy both of which Sugar Creek Church is the sponsor and overseer. 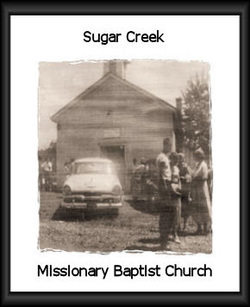 On Jan. 28, 1954 Sugar Creek Church gave arm and Royersville Missionary Baptist Church was organized. That Church is healthy and strong doing the Lord’s work yet today. Over the years God has called a number of Gospel Preachers from the ranks of this body. 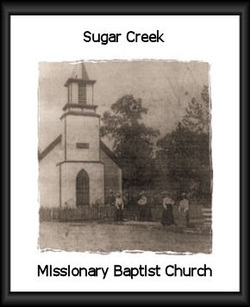 We have no official record of them from the time Sugar Creek was organized up to about nineteen hundred thirty seven but from that time to the present at least nine men have answered the call to preach God’s Word. We are also associated with The American Baptist Association and the American Baptist Association of Theological Schools. The Church today enjoys services with Bible School and Worship on Sunday Morning, Sunday Evening Worship, and Wednesday Evening with Adult and Youth Bible Study. Our largest service is Sunday evening. We have an effective youth program with capable leaders and the Church is careful not to forget the shut-ins and those in the rest homes where several services a month are conducted. God has richly blessed with teachers and an abundance of musical talent and willing workers in all of the ministries of the church. We covet your prayers as we go forth in this great work. present site of Sugar Creek Missionary Baptist Church.